Discover a Hebrew School your children will love! 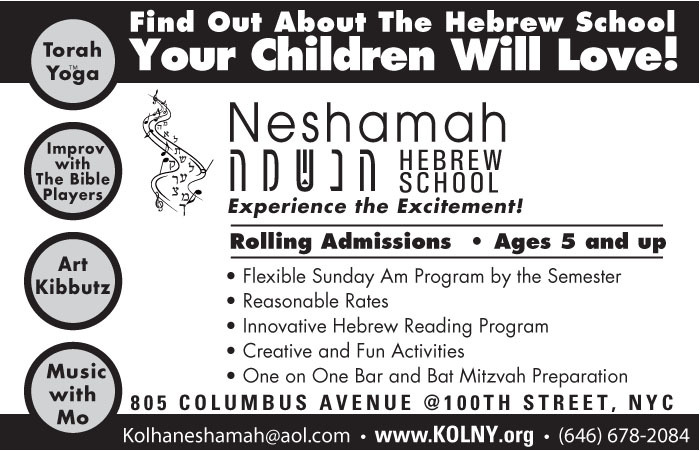 The Neshamah Hebrew School provides a nurturing environment for children ages 5 and up. Utilizing a multidisciplinary approach and interactive methods of teaching , the school offers both at home and in school flexible learning. Children can enroll for the whole year or by the semester. Discover Torah Yoga tm, The Bible Players Improv, Music with Mo and Art Kibbutz. Private Bar and Bat Mitzvah program available. We also offer help with Jewish life-cycle events. The school meets at 805 Columbus Avenue @100th Street . Contact our office for more information or email us.